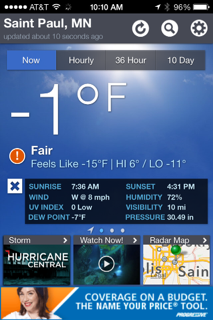 Restoration Professionals: Brrr - It's cold out there. Brrr - It's cold out there. When it gets this cold outside, it is important to protect yourself against the elements but it is also important to protect your home from damage that frequently accompanies this type of weather. The most common cause of water damage that we see this time of year is from frozen burst pipes. When water freezes, it expands. As it expands, it can cause pipes and other water conduits to burst. However, you may not realize you have a broken or leaky pipe until it warms up a little and the ice thaws and water starts flooding your home. By this time, you should have put away garden hoses and turned off the water supply to all outside faucets. You should also check crawl spaces and other boxed-in areas where water pipes are located to make sure there is adequate heat supply and good warm air flow around pipes. When planning to be away from home for more than a day, have someone check your house to make sure the furnace is working properly. We had many calls from property owners who return from vacation to find their furnace stopped working and their entire home is an icy disaster. If you do suspect you have a frozen pipe, your best bet is to call a plumber. Attempting to thaw the pipe yourself can result in more damage. Open flames and torches can cause further damage to pipes and are a fire hazard. The plumber can also check to see if there are leaks before the ice melts and starts causing more problems. If you have a burst pipe, Restoration Professionals provides 24 hour emergency water damage mitigation. We can extract the water, set-up drying equipment and also check walls, ceilings and floors for moisture and further water intrusion. Most homeowners insurance polices will cover water damage from burst pipes. Restoration Professionals has the knowledge and expertise to assist with your insurance claim. Put the Pros on your side!